In what could best be described as the "calm before the storm" at the box office this weekend, Warner Bros.' In the Heart of the Sea is the only new wide release, with Universal's Legend expanding nationwide. According to projections from BoxOffice.com, In the Heart of the Sea is set to take in $17 million during its opening, which is low by mid-December standards, but should be enough to end the three-week reign of The Hunger Games: Mockingjay Part 2. The low figures are attributed largely to the massive release of Disney's Star Wars: The Force Awakens on December 18. In the Heart of the Sea stars Chris Hemsworth, Tom Holland, Cillian Murphy, Benjamin Walker, Charlotte Riley, Brendan Gleeson, Ben Whishaw, Frank Dillane, Michelle Fairley and Paul Anderson. Ron Howard directs this adaptation of Nathaniel Philbrick's book, with Charles Leavitt, Rick Jaffa and Amanda Silver writing the screenplay adaptation. 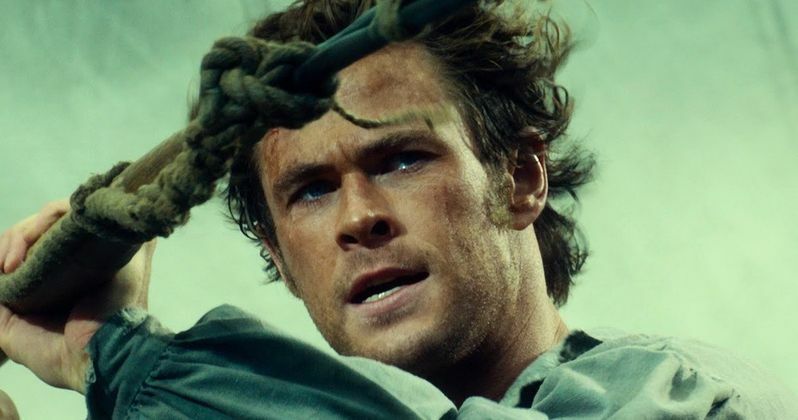 Even with the star power of Chris Hemsworth, In the Heart of the Sea, which cost an estimated $100 million to produce, may sink at the box office. The Hunger Games: Mockingjay Part 2's three-week streak will come to an end this weekend, taking in an estimated $10 million in its fourth frame in theaters. The Hunger Games: Mockingjay Part 2 opened with $102 million, the lowest of all four films in the franchise, and it currently sits at $227.3 million after three weeks in theaters. While we'll have to wait and see if it can surpass $300 million domestically, it seems like a long shot that it will surpass The Hunger Games: Mockingjay Part 1's domestic total of $337.1 million. It's possible that these middling grosses could help put an end to the trend of studios splitting the final novel of a trilogy into a two-part movie, but we'll have to wait and see. Universal's Krampus, which performed better than expected last weekend, opening with $16 million, is expected to drop to third place with $9.2 million, with Creed ($8.8 million) and The Good Dinosaur ($8.2 million) rounding out the top 5. Krampus has already turned a profit, since it was produced for just $15 million, following a horned beast who punishes naughty children at Christmastime. When dysfunctional family squabbling causes young Max (Emjay Anthony) to lose his festive spirit, it unleashes the wrath of the fearsome demon. As Krampus lays siege to the Engel home, mom (Toni Collette), pop (Adam Scott), sister (Stefania Owen) and brother must band together to save one another from a monstrous fate. The supporting cast includes Allison Tolman and David Koechner, with Michael Dougherty (Trick 'r Treat) directing. Rounding out the top 10 will be Spectre ($3 million), The Night Before ($2.7 million), The Peanuts Movie ($2 million), Spotlight ($1.6 million) and Brooklyn ($1.2 million). Despite expanding nationwide, Universal's Legend could be the latest wide release to debut out of the top 10 this weekend, following flops like Jem and the Holograms and Scouts Guide to the Zombie Apocalypse. Legend is expected to take in less than $1 million in its opening weekend, despite a critically-acclaimed dual role from Tom Hardy. The film opened November 20 in limited release, earning $86,836 from four theaters for a $21,709 per-screen average, but it's per-screen average has been dropping steadily since then, despite adding more theaters each week. It isn't known how many theaters the crime drama will expand into this weekend. Opening in limited release this weekend is Paramount's The Big Short, Gravitas Ventures' Bleeding Heart, GKIDS' The Boy and the World, Lionsgate Premiere's Don Verdean and Freestyle Releasing's The Girl in the Book.